The Ultimate Standing Seam Fall Arrest System! 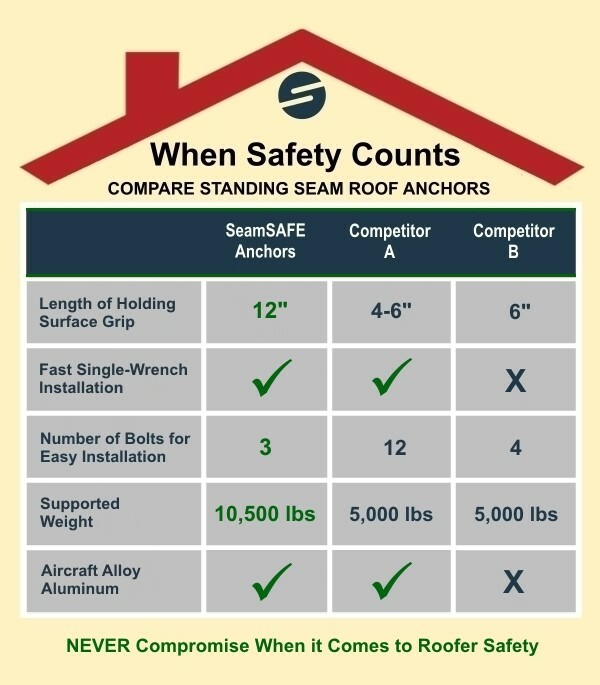 SeamSAFE is a light-weight, metal roof anchor that can be installed in seconds. A must for anyone working on a standing-seam, metal roof! Advanced design and expert engineering makes SeamSAFE Roof Anchors the superior choice for fall-arrest protection for anyone working on a standing seam metal roof. SeamSAFE anchors protect roofers with the most secure and largest gripping surface of any anchor in the industry. They are certified to support up to 10,500 pounds. Installation takes a minute or less and only requires a single wrench. Repositioning is fast and easy. Once a SeamSAFE anchor is properly secured to a metal roof seam and tethered to a roofer’s belt or harness, the anchor prevents falls. In addition, SeamSAFE anchors can be paired with SeamSAFE Roof Brackets to offer flexibility throughout a roofing project. The brackets provide a means to mount a walkboard for roofers to use during installations and repairs. SeamSAFE brackets also can be used to create a rooftop staging area for gear and materials. SeamSAFE anchors function on a temporary or permanent basis. In addition to fall protection, the anchors are used to attach solar panels, roof jacks, ladders and other devices to standing seam metal roofs. When fitted with SeamSAFE Mounting Adapters, the anchors safely secure heavy equipment such as HVAC units, satellite dishes, handrail systems, industrial piping, and other rooftop equipment. As with all safety devices, a qualified person should always inspect anchors before use. Roofers can install a lightweight SeamSAFE anchor in a minute or less. SeamSAFE anchors and brackets set a new standard for fall protection and versatility. SeamSAFE brackets are easily paired with SeamSAFE anchors and support roofers, tools and materials. With forty years in the roofing industry, SeamSAFE Founder Doug Mullins is intensely aware of the hazards and safety concerns of installing and repairing roofs. As a roofer, he knows first-hand that roofing professionals face among the highest risk of falls and fatalities in the construction industry, which is data reported by the Center for Construction Research and Training. After surviving a treacherous fall during a roofing job, Doug invented SeamSAFE anchors and brackets. His advanced design and quality materials make roofers more productive and virtually eliminate the possibility of a fatal accident. Why trust fall protection to anyone else? SeamSAFE roof anchors have been rigorously tested for performance and safety. They meet or exceed OSHA and ANSI standards. Multiple anchor sizes are available to accommodate nearly every standing seam metal roof. We also make custom anchors to meet your specific requirements. Our expert technicians are available to talk with you about your specific needs and help you select the correct anchor size for your roofing profiles. It is important to note that other manufacturers have tried to replicate the look and function of our patented anchors. Yet, SeamSAFE’s quality, design integrity and safety protection is unsurpassed.